Bees have always shown what it means to live in a harmonious system of collaboration. These tiny insects are a testament that a team made up of hard-working, determined, and well-organized members can be endowed with the greatest of tasks. Bees help sustain the Earth’s ecosystems. The vast majority of the crops we consume depend on bees for pollination. Does that mean our lives depend on bees? Yes, to a certain extent. Unfortunately, these workaholic insects are currently in distress. That’s why scientists, beekeepers, and bee lovers around the world are working arduously to rescue bees and raise awareness about this issue. Two of those people are in Puerto Viejo, Costa Rica. They’re husband-and-wife-beekeepers, Carlos Cortes and Liz Paniagua, and the founders of Api-Agricultura’s, an organization dedicated to protecting and preserving bees while teaching others about their importance. “I have always been drawn to bees, since I was a 5-year-old boy,” Carlos said. However, he said bees weren’t seen in the best light by locals in his community. When he grew up, he came up with an idea to bring locals more information about bees. The goal was that community members would learn to cherish them. “I want people to relate to bees in an intimate way, that will make them realize their importance in the ecosystem,” he emphasized. To successfully pass on this message, Cortes and Paniagua have devised an innovative project, which intends and teach schoolchildren to love and care about bees. Carlos Cortes: When we came up with the idea about creating Api-Agricultura, I told my wife that if we really wanted to reach more and more people with our message, it would be great to implement a plan that would efficiently foster the significance of bees in the ecosystem. We consider that an environmental class imparted to school kids was fundamental to reinforce our initiative. This is how we began structuring our project with an educational approach aimed at children from public schools. Kids are like sponges they tend to quickly absorb what they are taught. In addition, we have designed school gardens, where we grow tomatoes, cucumbers, and plantains, and by doing so we teach students about the interaction between agriculture and bees. If there are no bees, there is no agriculture, and if there is no agriculture, there are no bees. We breed different kind of bees that we have incorporated to the school gardens, most of them are gentle bees so kids can safely interact with them. Your daughter seems to be involved in this effort, too. How do you feel about it? Liz Paniagua: We are very proud of her, because we have seen our love of bees reflected in her. Every time she has to present her science project, she opts for bees. We want this not only for our daughter, but to shape all children’s mentality about bees. They are the future, and if we inspire them to look after them, bees will be better off. Your organization’s motto is “Protecting bees is life.” Why is it so important to rescue bees? Paniagua: For me, bees are a resource for life. They are the greatest pollinators in the ecosystem. They have the responsibility of global pollination on their shoulders. Pollination produces seeds, and this means bees play a key role in the food chain. Their contribution to biodiversity is beneficial to all living things. What is threatening bees, currently? Paniagua: Over the past years, there has been a global phenomenon called colony collapse disorder (CCD), which is significantly attributed to the use of pesticides, herbicides, and monoculture; this latter means growing a single crop for several years on the same land. Locally speaking, logging can be a factor, but here in my southern Caribbean community, I have seen a lack of information in regard to the bees. This unawareness about their importance can be detrimental. People sometimes perceive bees as a threat rather than allies. What is it like to work together? Cortes: We are aware that this is a joint effort, we make a great team. I am lucky that she is my wife, my friend, my partner, and to be able to share her love of bees with me is a great joy. Paniagua: I am very grateful to God, I have a husband that has taught me so much about bees. Because of him, I came in contact with them, and I ended up falling in love with bees. I think many couples have affinities in different regards, some like to talk about sports, and others like us enjoy to talk about bees. Cortes: We even dream about bees. Carlos and Liz have several plans for the future. They want to run a bee tour designed for locals and tourists. The National Distance Education University (UNED) is also interested in supporting their initiative by doing a research about the bee species they keep at their organization. Api-Agricultura has also been supported by volunteers from around the world who have come to Costa Rica learn more about their initiative. The project also follows a sustainability model certified by the Rainforest Organization, an international non-profit organization aimed at protecting the environment as a whole. To know more about their work, you can visit Api-Agricultura’s Facebook page. 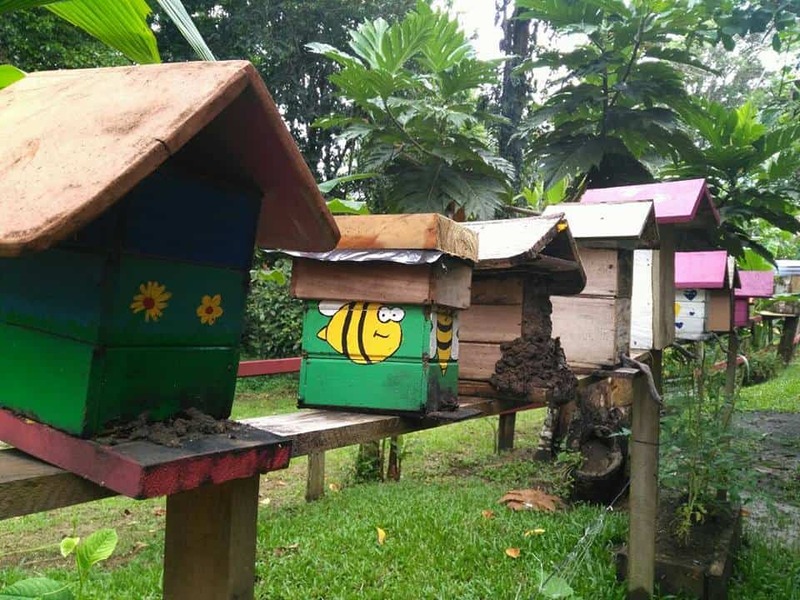 Can Costa Rica save its bees?